The Beige Dragonfly medium 3 lamp Tiffany pendant light is a traditional interpretation of the iconic Tiffany Dragonfly design in natural muted colours of highest quality art glass. Hand cut pieces of finest art glass are hand soldered using traditional techniques to create this complex Tiffany design. A wonderful 41cm diameter Tiffany pendant, featuring a beautiful blend of subtle cream colours, natural shades and clear jewelled beads that will sparkle when illuminated. 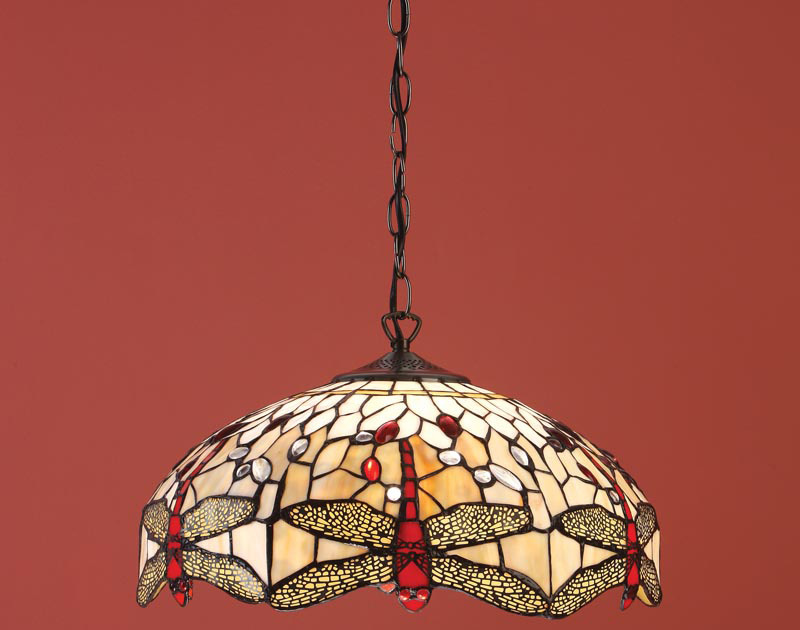 A striking dragonfly design, with a translucent red glass body and glistening golden amber wings. The dark bronze finish ceiling mount and height adjustable chain suspension allows the removal of links to suit your ceiling height, minimum drop 47cm, maximum drop 150cm. This is a hand-crafted Tiffany pendant lamp and the shade colours may differ slightly from the image shown, as each piece of glass is hand-made and may differ slightly in colour or shade. This should not be seen as a fault, rather something that makes each Tiffany shade unique. The Beige Dragonfly medium 3 lamp 41cm Tiffany pendant light, designed and manufactured by Interiors 1900.